Wilbert H. Rusch published an account in The Creation Research Society Quarterly 7, 1971 of a rough, cast iron pot that was found in a mid-Pennsylvanian coal seam at the Municipal Electric Plant in Sulphur City, OK. 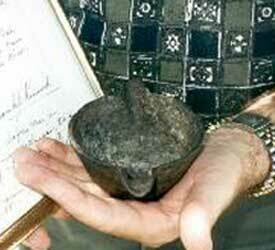 The artifact is now archived at Creation Evidence Museum. This small implement was embedded inside a single large lump of coal. 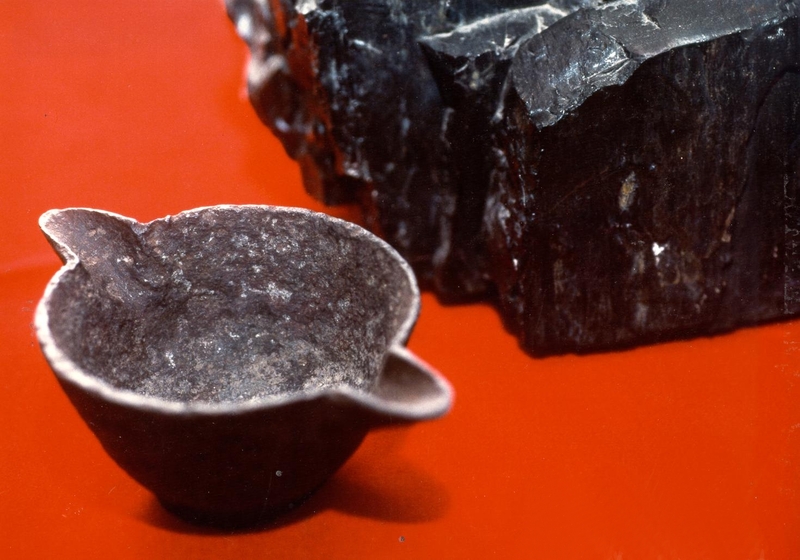 While other coal artifacts have been found, but few have been well documented or analyzed. 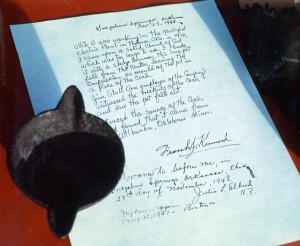 In this case, there is a notarized letter documenting the authenticity of the find. While I was working in the Municipal Electric Plant in Thomas, Okla. in 1912, I came upon a solid chuck of coal which was too large to use. I broke it with a sledge hammer. This iron pot fell from the center, leaving the impression, or mould of the pot in a piece of the coal. Jim Stull (an employee of the company) witnessed the breaking of the coal, and saw the pot fall out. I traced the source of the coal and found that it came from Wilburton, Okahoma Mines. Julia L. Eldred N.P. My commission expires May 21, 1951 – Benton Co.
A handful of other such artifact-in-coal accounts have been recorded (Sanderson, Ivan T., Uninvited Visitors, 1967, pp. 195-196. ), including an intricate gold chain found in coal. The Morrisonville, Illinois Times, on June 11, 1891, published a report that Mrs. S. W. Culp found a circular shaped, eight-carat gold chain, about 10 inches long, embedded in a lump of coal after she broke it apart to put in her scuttle. The chain was described as “antique” and of “quaint workmanship.” The story said only part of the chain was revealed when she first broke open the coal, and that the rest of the chain remained buried within the coal. The coal came from one of the southern Illinois mines. Unfortunately the artifact has since disappeared.